One of the most famous places to see on Crete is the Samaria Gorge, Europe’s largest gorge. This National Park is 13kms long with unbelievable natural beauty. The gorge is rich with many endemic flowers & herbs with crystal clear spring water flowing from the mountains. – you can even refill your water bottles with it (at specific points). 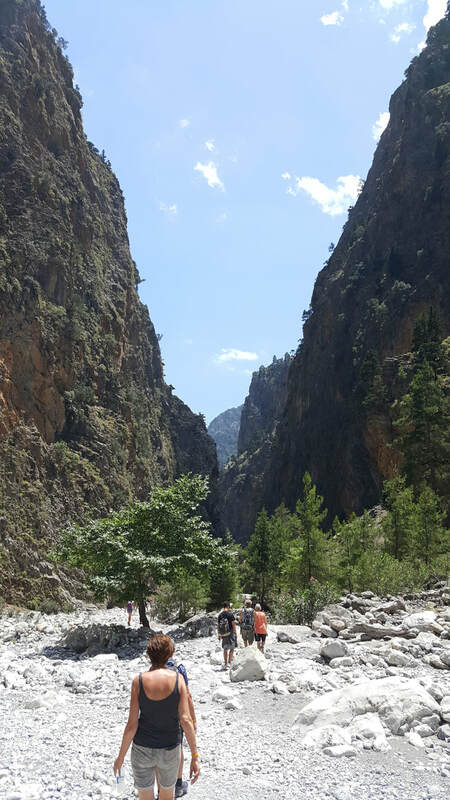 The average walking time through the Samaria gorge is 4-6 hours & is on a foot path with rocks & along the river bed. It is mostly downhill (particularly steep in the beginning). 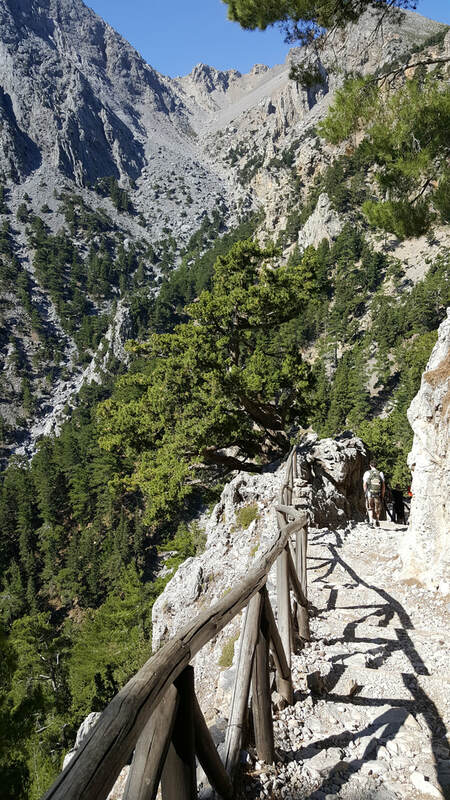 Starting at 1,250m height amongst the White Mountains (Lefka Ori) the path winds down the mountain & into the depth of the gorge, to the narrowest point which is 2m wide! There are rest stops & toilets throughout the gorge & places where the fresh spring water runs to refill your water bottles. At the end of the park, the remaining final walk (3kms) is in the sun. You can get a ride on a minibus for 2 Euros (payable locally), if you don't want to do the last part. Agia Roumeli village is where you can enjoy a swim in the Libyan Sea or have lunch one of the many tavernas. From here there is a ferry that takes you to Sougia village, where the coach is waiting for you at the harbour & you drive back over the mountains to the north coast to the place where you were picked up. The guide on the trip will give you information on the coach & you are free to walk at your own pace. The guide follows the group to ensure everyone comes out at the end & he/she is there if you need any assistance. The guide tells you where to meet at the bottom & it is a hassle free trip. Itinerary - The trip starts with an early pick up from the nearest point to your accommodation (between 05.30 -06.30) and drive through the mountains passing the plateau of Omalos. - You will stop at Omalos at one of the tavernas to get a coffee / very simple​ breakfast and then you are taken to the start of the gorge at the "wooden stairs". There is another shop at the starting point as well selling fruit/sandwiches/drinks & walking sticks. There are toilets and rest stops as well as rangers all the way through. 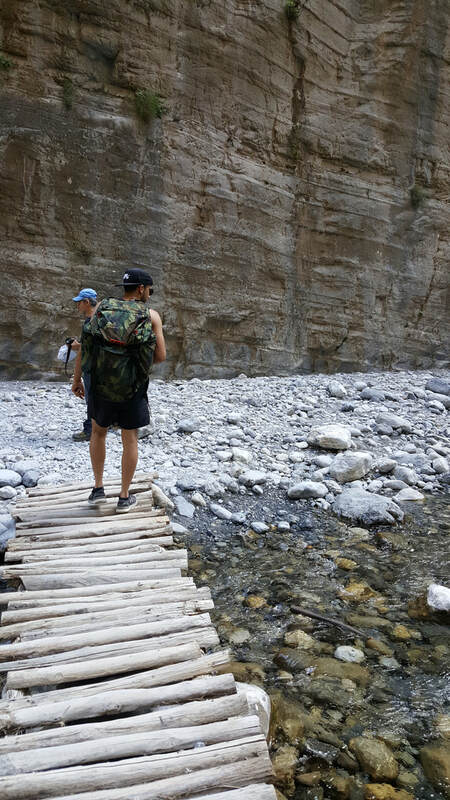 Note: If you suffer from a heart condition, high blood pressure, breathing problems, weakness of knees or other knee disorders, vertigo, or pregnant women- THE SAMARIA GORGE IS OFF LIMITS TO YOU, for your own safety! This is not an easy walk. It’s 12miles/18kms of sometimes very steep and rough terrain. The heat is also a factor that you must keep in mind. Hiking boots are the best, but trainers with good grip will do. Just don't wear new shoes! The footpath in the beginning. We are waiting for the opening of the gorge on the 1st of May, this gets decided only a few days before! ** Plus this winter the heavy rains caused damage to the road going up to the gorge & we are awaiting news from the authorities as to when it will be fixed. Or an alternative access route will have to be made. 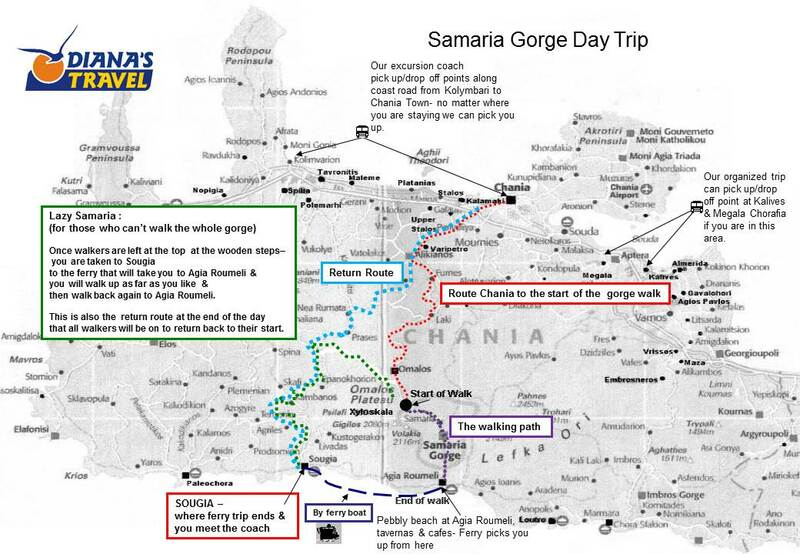 So we all await updates about the Samaria Gorge for 2019. ONCE THE GORGE OPENS- WE CAN THEN TAKE BOOKINGS! Below is all of the information about the trip that you need to know. Please note that in Spring only a few days a week the trip will go & then more days are added come June onwards. -It is not recommended for children under 5 years old for safety reasons. Walking shoes/boots or trainers with a good grip are a must! Light pair of sandals or flip flops, so you can get out of the walking shoes at the end. Walking stick if you have one with you. 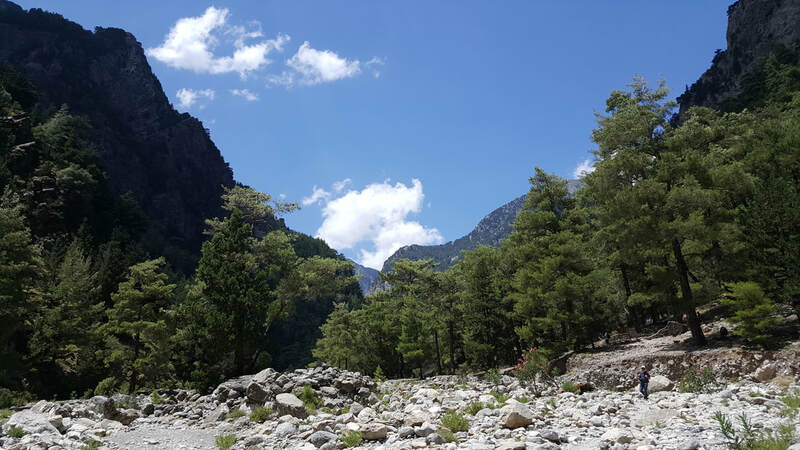 To book the Samaria Gorge Day Trip, you will need to book at least 1 day in advance to reserve your seat & make payment. You start the same as the other walkers, so you will see the top of the gorge, then you will continue on to Sougia in the coach & get on the ferry there to Agia Roumeli. From Agia Roumeli you will walk up the gorge. You should be able to reach the narrowest point (but at this stage the long walkers are coming down). Then you walk back down to Agia Roumeli & continue the trip like everyone else. NOTE: You will pay for two ferry trips (hence the price). To book the Samaria Lazy Day Trip, you will need to book at least 1 day in advance to reserve your seat & make payment. Agia Roumeli -"the finish line"
Just before the narrowest part. Poppys in spring on the Omalos plain.